The Most Amazing Crab Cakes Ever Japanese "Popcorn"
One of my all time favorite recipes for Chili YUM!! Hey, we made this using Oryx, really good! Also, I added diff. 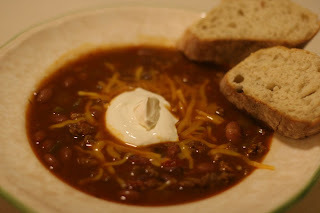 kinds of beans-I love black beans, they always add a little bit of a smokey flavor! Speaking of Chili, you would think that "Cheli's Chili", a specialty of Chris Chelios' restaurant would be good. But it isn't, it's thin, watery, tomato soup type stuff. Blech.